The National Assembly passed a resolution approving the State budget balance in 2016 and another on the NA’s supervision program for 2019 during its sitting in the morning of June 12. 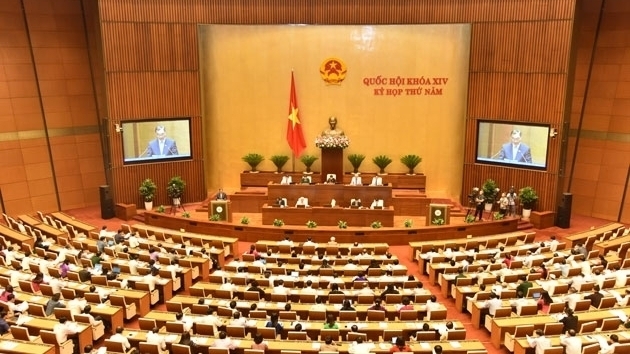 Under the NA resolution approving the State budget balance in 2016, total budget revenues stood at VND1,407,572 billion, and total spending at VND1,574,448 billion, translated into overspending of VND248,728 billion, equal to 5.52 percent of the Gross Domestic Product (GDP). The overspending was financed by domestic loans (VND197,165 billion) and foreign loans (VND51,563 billion). The resolution on the NA’s supervision program for 2019 said at the 7th session, the NA will consider the Government’s supplementary report on socio-economic performance and state budget implementation in 2018 and the first months of 2019. The NA will also examine the NA Standing Committee’s reports on the implementation of supervision proposals of NA committees, NA deputy delegations and NA deputies (if any), and on the supervision of the settlement of voters’ petitions sent to the 6th NA session. The NA’s 7th session will also conduct supervision of the implementation of policies and laws on land planning, management and use in urban areas since the 2013 Land Law took effect to the end of 2018. At the 8th session, the NA will scrutinize reports on the performance in 2019 of the NA Standing Committee, the NA Ethnic Council and other NA committees, the Government, the Supreme People’s Court, the Supreme People’s Procuracy, and the State Audit. The NA will also look into the Government’s report on the implementation of socio-economic development plans and State budget in 2019, along with socio-economic development plans, State budget estimates and State budget allocation plan for 2020. The NA will examine reports of the Government, the Supreme People’s Court and the Supreme People’s Procuracy on handling complaints and denunciations. The Government will also submit reports on the enforcement of the Constitution, laws and NA resolutions; performance in fighting corruption and wastefulness, practicing thrift, controlling crimes, executing judgements, and realising the national goals on gender equality. Also at the 8th session, the NA will conduct supervision on the implementation of policies and laws on fire prevention and control in 2014-2018.